Photo by St-Even from the Torontoist Flickr pool. For the 57,000 passengers who travel Toronto’s busiest streetcar route daily, relief is on the way. 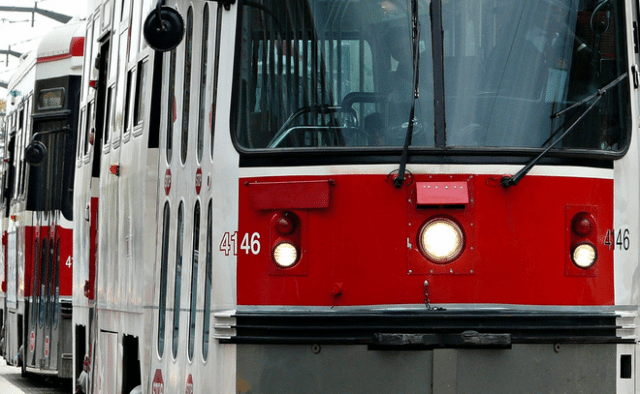 Starting January 1, 2015, the TTC will implement a proof-of-payment system allowing customers to board the 504 King streetcar through the rear doors between 7 a.m. and 7 p.m., a measure that is expected to reduce boarding times significantly. Mayor John Tory announced the new policy this morning, accompanied by TTC CEO Andy Byford and the commission’s new chair, councillor Josh Colle (Ward 15, Eglinton-Lawrence). Tory noted that 20 per cent of streetcar trips are spent servicing stops, and said the new policy will cut boarding times in half. Passengers with a Metropass or valid transfer will able to board the rear doors. Customers paying with cash, token, or ticket will have to grab a transfer to use as their proof of payment. Byford said the new policy is part of the TTC’s goal to implement all-door boarding on all streetcar routes through 2015. A TTC staff report released in August recommended the policy as one of nine “opportunities to improve transit service” [PDF]. “We need to see this as one piece in the jigsaw of providing much greater capacity for the streetcar network,” Byford said.